The earliest oracle bone script about "human" features a hard-working image that stoops and plumbs arms, representing the only civilization-creating creature on the earth. And housing is exactly the habitat of human population and civilization. With the constant evolution of "humans", the dream of residence has kept evolving and the housing people live on has kept reforming. Over the decade, Landsea has intensified operations in green housing field. Guided by the green strategy, Landsea has upgraded from its single product line to multiple product lines covering customers life cycles on basis of its studies on customer demand. In summary, customers can find suitable green housing from Landsea at their different stages of life. Those young people who are getting married or newly wedded are in the early days of their career and life. They pursue a quality life and are hopeful about their future life. 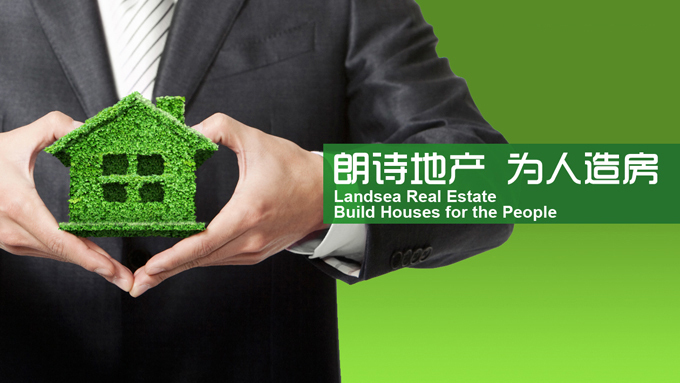 Landsea offered them cost-effective happy homes, such as Shanghai Landsea Future Tree and Suzhou Landsea Future Block. For the working and living convenience of young people, Landsea chose plots directly accessing subway and bus, and ensured short-range basic living support such as supermarket and catering. Landsea used modern lines and bright colors in facade. In housing design, compact low-price two-room and three-small-room types predominate, with functional space maximized. Besides, Landsea offered these customers extra green equipment such as air-conditioning system and negative pressure ventilation system, and properly arranged systems according to temperatures in different areas and air flow simulation at different altitudes, thereby surprising vigorous families. With the birth and growth of children, the career of young couples has become increasingly stable and they begin to long for housing expansion and life improvement. Landsea prepared a series of improved products with cozy space and perfect life support, and offered quality property services. At the beginning of design, Landsea adequately simulated micro-environments of plots including lighting, wind and acoustics, thereby rationally arranging community planning and product design. Besides, Landsea gave play to our advantage in technological real estate to provide full-replacement ventilation systems based on appropriate temperature and humidity, thus creating quality and healthy life for happy families. Time flies, when families have become mature, people have developed the desire to create better living environment for family members, in the hope of improving living quality substantially. Over the decade, Landsea offered customers at this stage a multitude of green-tech housing standing market tests. In superior sections, Landsea pursed the perfection of housing type, facade, community planning, supporting facilities and property service. By mature technological means, Landsea offered inhabitants healthy, comfortable and energy-conserving experience. Some customers understanding of residence has gone beyond housing: hosts hope for scarce resources such as core section, natural environment and humanistic atmosphere, and the hostesses want neighbors with same interests. In flourishing or picturesque sections, Landsea provide superb choices to these customers with higher improvement demands. Real estate for the elderly is another sector for which Landsea is making elaborate preparations. With more time and energy to enjoy life, the elderly will pay more attention to health and comfort. Their housing should brim with warmth. In projects such as Nanjing Landsea Green Block and Changzhou Xinbei Green Town, Landsea tailored some products to the needs of the elderly in terms of safety, barrier-free property and comfort. Such as eliminating indoor-outdoor altitude difference, renovating kitchen & toilet design, widening corridors for wheelchairs, setting up armrests on walls and making colors of building facades identifiable to the elderly. Besides, Landsea have designed more public space for elderly apartments and offered services such as medical treatment, living and travel on a selective manner. Guided by the green strategy, Landsea will uphold the concept of building housing for man and offer more customers healthy and cozy green housing.